This past weekend we invited a neighbor gentleman over for dinner, and I know how much he loves having a home cooked meal. Since it is such a treat for him, I try to make a full course meal, including dessert, whenever he joins us. This past week I knew I had cut my meal prep time to short and was going to need to find a short cut somewhere. I tried remembering some tried and true desserts that would be fast to prepare. Somewhere out of my memory bank, I remembered my mom's Creme de Menthe Cake. It has probably been twenty some years since Mom made this cake, so long in fact, she didn't even remember this recipe. Thankfully, my memory can be sharp as a tack on odd trivial pieces of info, so I knew the exact book where she had the recipe. Mom scanned it, emailed it, I went shopping, and the cake was a hit! This is so simple. Perfect quick answer to an impressive cake. You know it's good when the neighbor gentleman, politely asked if he might be able to take a little bit of cake home with him! Make cake following directions on box, adding two tablespoons of Creme de Menthe. Bake cake following directions for 9x13. Cool cake. Once cake has cooled, warm 6 ounces of fudge topping. Warm it enough that you can pour and spread it on the cake (you don't want it so hot that it runs off the cake). Spread fudge topping, completely covering cake. Set cake in refrigerator for 15-20 minutes. 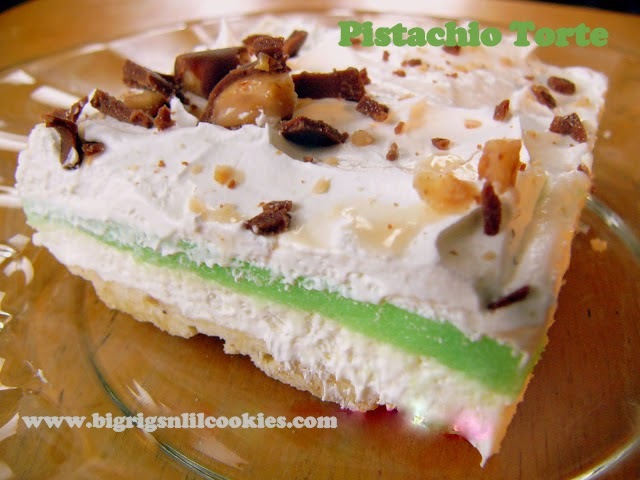 Meanwhile, add remaining Creme de Menthe, and green food coloring to Cool Whip. I added three drops of food coloring to get the shade of green I was looking for. Spread over top of fudge layer. The cake looks super! Totally love the light green colour. What a great recipe for St. Pat's Day! This is the cake I have EVERY YEAR for my birthday! I LOVE this cake!! It's the exact recipe I have too! G'day! This used to be one of my fave cakes when I was little! Such a sweet hostess and with this yummy recipe, he will be coming back time and time again!!! Yum!!! Oh, Kris, I love this cake and the story that went along with it! :) It's just as pretty as it can be, and I know it must be delicious. That's so funny that you knew exactly where to tell your mom where her recipe was! Thank you for sharing this at Treasure Box Tuesday! Is there a difference between creme de menthe and mint extract? In my opinion there is a flavor difference. If you like mint extract though, you could definitely substitute it for the creme de menthe. I love this cake! My Grandma used to make this cake, except she always made it with chocolate cake. It was always one of my favorites! Oh what a treat. How wonderful you fed your neighbor...no doubt he really appreciated it. Thanks much for sharing with us at Weekend Potluck.